I came into the barn at 6:30am and Jethro had already begun striking his stall door and braying his head off. We began prepping for showmanship after he ate breakfast, and he wanted to GO. Halt meant walk quickly, walk meant trot, and trot meant bolt-and-cause-Hannah-to-sprain-her-ankle. 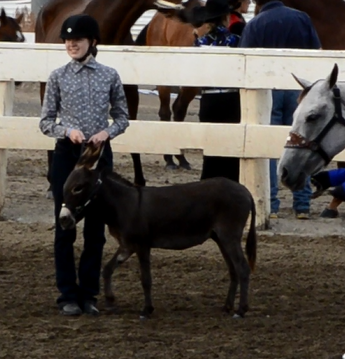 Unlike last year, I had the pattern memorized and felt quite confident, minus having to handle an out of control donkey. The judge was very tough and kind of reminded me of a western George Morris. Jethro was the only yearling, and at the judge's discretion he was mixed in with the green horses. Right off the bat, people were called out for this and that, but the judge did compliment how "nicely groomed that mule is," (how to offend a donkey person 101: call a donkey a mule). 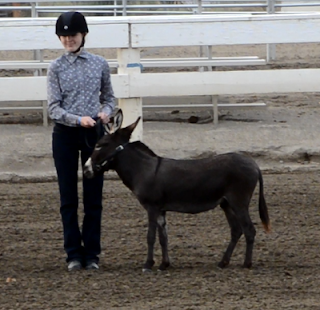 The pattern was simple: trot halfway to the judge, trot circle right, halt upon completing the circle, back five steps, trot to the judge, halt, set for inspection, do a 180* haunch turn, and trot back to the line up. This was the moment where he grabbed the lead rope in his mouth and wouldn't let go. There was one key problem: once in the ring, Jethro adamantly refused to trot halfway through (though, ironically, he really wanted to trot after we exited the ring). We did a nice job trotting the circle, halting, and backing. He fell apart when I asked him to do the haunch turn and pulled back as we were supposed to be trotting away. Once in the line, ants filled his pants, and it took all of my strength to hold him back. Note how only one of us is trotting. 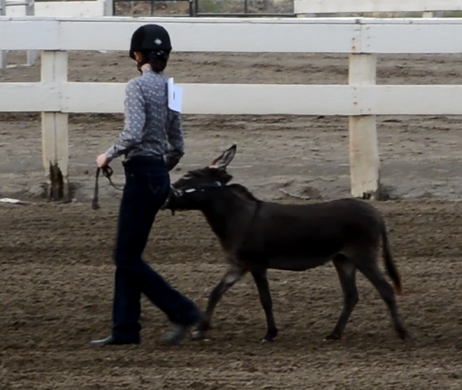 According to the judge, our back was resistant and slow (90% disagree, I watched the video and his back looked great except for a small head toss on the last step), but our haunch turn was nice (100% disagree, it was nowhere near a correct haunch turn, his back leg wasn't even close to being planted, he took a couple steps forward, and he tried to drag me). He liked my use of the quartering system and said Jethro was very well groomed. We ultimately came away with a grand champion ribbon by default and a white ribbon. For those of you who are not familiar with 4-H, white means "at least you showed up and paid the entry fee." From his other comments, it sounds like he was unimpressed that someone my age would have such a resistant animal. While I definitely don't approve of this misbehavior and take the blame for it seeing as how I hadn't been working with him much, I actually found it quite hilarious. He was a huge character and definitely let me know what he thought of showing that day! Plus there is something comical about an adorable, defiant 30" tall animal misbehaving in a ring with huge horses. The judge got a lot of hate throughout the week, but while he wasn't my favorite, I thought he was alright. While I thought a couple of the comments I received were incorrect, I actually quite liked him and will definitely work on a couple of things he suggested... but as much as I love mules, it was rather disappointing to have someone think Jethro was one. He's 100% miniature Mediterranean donkey, and I take great pride in how huge his ears are. oh man, even when he's being a little naughty Jethro is so stinkin cute. congrats on making it through with a couple nice ribbons!